Starcraft - Nothing Special, right? Starcraft 2 recently came out so, naturally, I just installed Starcraft for the first time. A few years ago, I decided to atone for that summer my brothers and I had played Warcraft III from an illicit copy by buying the Warcraft III Batlle Chest. It was a pretty awesome deal – for $20 I got the main game, the expansion, and strategy guides for both games. The following year I bought the equivalent bundle for Starcraft. I would have played it about six months ago when Dina’s boyfriend, a Starcraft (and Blizzard, in general) fan was over the house. But, a bug in Windows XP kept the game from installing. When I tried it again this weekend, it worked. So I started a Terran (human) campaign so I could follow the story in order. So far, according to raptr, I’ve played 5 hours. I’ve gotten through the first six or so campaigns. I’m really not sure what the big deal is. Guess what? It’s a real time strategy game. I don’t see anything here that’s so amazing that people were so anxious for Starcraft 2 to finally show up. Maybe I’m just 12 years too late to the party, but what’s so special about this game? You build a base, you build units you attack others. There are different races or factions with different units. Seems just like Warcraft, Age of Empires, early Command and Conquer games. Maybe people just like space/aliens more than orcs/fantasy, historical, or speculative fiction units? I think the interface where they tell you what to do in the next mission is neat, but Command and Conquer had full videos with [poorly acting] humans years before. But Red Alert, released two years earlier had different units for the allies and axis. And I remember strategy being quite different for each faction. And Command and Conquer (vanilla), from the previous year, had GDI and NOD each with different units and defensive structures. The one series that was the worst at this differentiation was the Age of Empires series. Anyway, I didn’t mean this as flame-bait or trolling. I just don’t understand all the hoopla over Starcraft 2 (other than the fact that people have had to wait this long because of the programmers being busy with WoW), but perhaps someone can clue me in. Just looking at grunt units in SC makes it clear how different the units really are. Marines for the Terrans can shoot air and land and have health. They also have a special ability that can increase attack and move speed by a large amount at the cost of health. They are built one at a time out of a barracks. Zerg has the zergling, a super-fast ground attack only unit that comes out two at a time from the Zerg hatchery, except the hatchery is the building that produces all zerg units from larva. As a quick digression, this means that more hatcheries are required for faster unit production and the zerg really only need to construct buildings to have the ability to modify the genetic code of their larva. Protoss have zealots, slow, ground-only units that are the strongest grunt and have shields which regenerate over time alongside their actual health. Beyond that, Protoss buildings must be powered by pylons to do anything. Anyway, the point is that the RTS genre has moved on from StarCraft. Yes, you’re coming at it 10 years too late. Yes, WC3 had hero units, but whoever told you it was a SC clone was wrong. The story is just copying SC. This game had three races, not two, all perfectly balanced against each other (NOT EASY! ), unlike C&C. SC’s story elements were also revolutionary at the time. The mission briefings were standard fare, but notice how narrative is being told within the engine too. C&C never did that, story was always told in the stupid live action briefings. You are partly missing the point because you haven’t even tried to play as the other races which have some fundamentally different mechanics and partly because, like I said, 10 years later this is old hat. There’s also the Battle.Net factor. 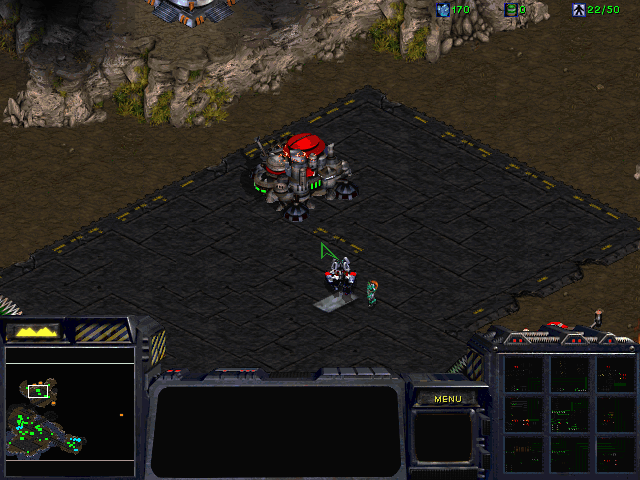 Prior to SC, there weren’t really any unified places to play an RTS. You had to call up your friend or LAN. SC had it all integrated in for free. I only slightly disagree with your disparaging of C&C. I think the strategies were pretty darned different between the two sides. One had that satellite weapon while the other had insta-vaporize defense towers. But I do agree that balancing 3 races/factions is harder than 2. I have read about the strategies with the different races (electricity and so on) – but that doesn’t seem to make it an AMAZING game. Looks like my assessment was right – I am too late, but also I feel I wouldn’t have been that impressed the first time around, either. Finally – why do you say that WC has only 2 races? It has humans, orcs, and undead. And Undead’s spreading of buildable territory appears analogous to the Zerg. WC2 is the game that preceeded this and they had one or two different spells, but only two races that were nearly identical. Ok, so that’s two things per faction in C&C that were different…the races all play fundamentally different in SC. You’ll see when you finally progress beyond the Terran campaign. The game won’t blow your socks off. It’s an RTS after all, but it’s far more refined than any other RTS I played until WC3 and SC2. WC3 added NE and UD and they were different, that’s true, but that’s a pedigree that comes from SC and owes itself to SC. That’s why I say it’s not a reskin at all. It really isn’t. It builds and grows upon SC, but it’s not SC with fantasy skinning at all. It’s a good game. I like it because it’s a really good RTS game that is well-balanced, has a large, interesting player base, and a lot of my friends are online playing. SC2 isn’t that great. It’s sort of cheesey and the graphics are pretty dated for a game that cost like 50 bucks. Blizzard has managed to make a fan base akin to Apple’s. They don’t care what the game is like, they just know they like Blizzard. I haven’t played SC2 myself, but some comments I heard from Blizzard fans before the game came out definitely makes me think that *some* of them are definitely as bad as apple fanboys. Maybe it’s because I haven’t legitimately played an RTS since WC3 and C&C Generals, but I find SC2 to be fun.